Broken springs, bent tracks and various other issues are not only annoying to deal with, they’re also dangerous. But garage door problems don’t always involve these parts. Sometimes the door stops responding or won’t open because it’s got a remote control problem, of all things. When that happens, you’ll a professional to conduct the garage door remote service that you require, whether that means repair or replacement depends on the severity of the issue. Technicians from Garage Door Repair Bothell will first troubleshoot the problem to make sure that it is in fact the remote that’s at fault, and then repair whatever the issue is, or simply replace your remote and reprogram the new one for you. Dead remote batteries – starting with the simplest and most obvious problem. Before you panic when you realize your garage door remote doesn’t work, first check on the batteries. All too often, people neglect that, and waste time banging on the remote needlessly. Physical damage – just like every other piece of equipment, garage door remote controls can get damaged, especially when they’re dropped repeatedly. Naturally, if the remote is broken, it’ll probably have some trouble working properly, or at all. Don’t worry, though. Replacing it is easy when you contact us. Wiring issues – your garage door remote, just like any remote really, consists of a protective casing and internal electrical components. If some of its wires detach due to various reasons, it won’t be able to produce the required electrical charge and create the correct command signals. Sometimes reconnecting the wires or replacing them can do the trick. Other times, replacing the entire remote is required. Transmitter got damaged – the garage door remote consists of more than just wires, of course. One of its components is sending the command signals, and if that component is damaged then the remote will effectively be useless. Signal interference – your overhead door remote works by sending a signal to the garage door opener each time you use it to open or close the door. However, the signal it sends can get blocked or jumbled due to some disturbance in the airways. If your neighbor has a similar garage door, for example, you may wind up opening your neighbor’s door and he yours unintentionally. This problem is often eliminated with newer opener models that utilize rolling code technology. Receiver problems – guess what? 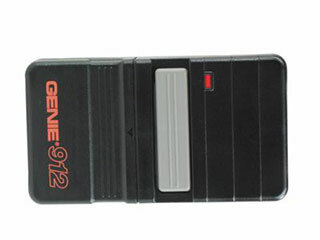 Your garage door remote not working may not even have anything to do with the remote itself. Your electric opener has a receiver unit whose job it is to receive the signal from the remote. If it malfunctions due to some reason, the remote will seem like it’s not working, while actually it’s the receiver’s fault. Electrical problems – keeping in line with this, your garage door remote may stop working because of electrical problems that have nothing to do with it. So be sure to check the wall switch and the opener’s power source, to make sure that the unit is actually getting enough power. If you find yourself in need of garage door remote service of any kind, all you need to do is get in touch with us. You’ll get a technician over that same day, who’ll repair the remote or replace it for you. Don’t worry. You won’t have to start reprogramming your garage door opener by yourself. Our expert will take care of that too, and you’ll return to using your automatic overhead door just like you used to. Contact Garage Door Repair Bothell for any and all service needs, any day of the week.